“There was war in heaven,” John tells us in the lesson from The Book of the Revelation of St. John the Divine. While it might seem to be at the opposite end of the biblical spectrum this reading from the very last book of the Bible complements the opening chapters of the very first book of the Bible, The Book of Genesis. Angels are very much a feature of creation. Angels cannot be seen. They can only be thought. In a way, that is the whole point. They are pure, intellectual and spiritual beings. Creation is not just about the visible world; it includes things unseen and invisible. Light is distinguished from the dark before there is even a sun and a moon. There is the whole idea of the invisible reasons for the visible things of the world. Angels are an important part of the theological reflection upon Genesis. They are an inescapable feature of the biblical landscape for Jews, Christians and Muslims. For Muslims belief in Angels is a fundamental part of the Islamic faith. For Jews and Christians, they are associated with the invisible things of creation. Angels help us to think about our humanity and our place in the world. They are an important reminder to us of our being as spiritual creatures, creatures who think and love, activities which are invisible yet real. In the theological tradition, angels are pure intellectual and spiritual beings; like us except they are incorporeal. They are, we might suggest in ways that connect to Plato and Aristotle and their successors, the thoughts of God in creation. So they remind us of an aspect of our being as spiritual beings. They remind us that we are not alone. We are at once attracted to and fearful of the idea that we are cosmic orphans adrift in an indifferent universe. The angels remind us of a great and innumerable company of spiritual and intellectual beings of which we are a part. 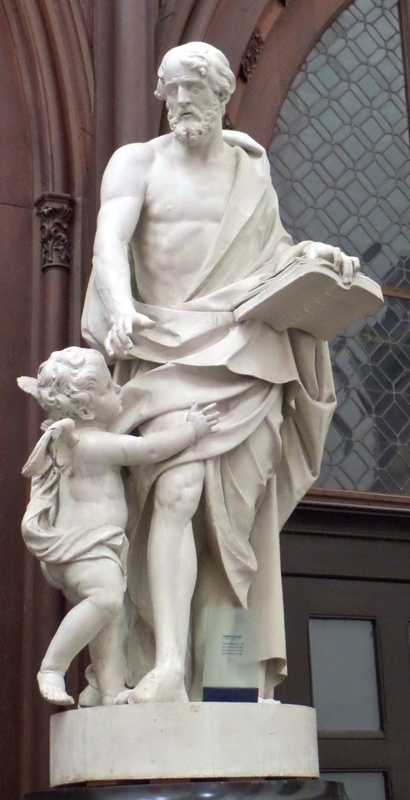 One of the most scholarly and learned early church fathers, St. Jerome devoted much of his life to accurately translating the Holy Bible from the original languages of Hebrew and Greek into Latin. Born near Aquileia, northeast Italy, of Christian parents, Jerome travelled widely. He received a classical education at Rome and travelled to Gaul where he became a monk. He later moved to Palestine, spending five years as an ascetic in the Syrian desert. In 374, he was ordained a priest in Antioch. He then pursued biblical studies at Constantinople under Gregory Nazianzus and translated works by Eusebius, Origen, and others. Travelling to Rome in 382, Jerome became secretary to the aged Pope Damasus. By the time the pope died three years later, Jerome had become involved in theological controversies in which he antagonised many church leaders and theologians. He left Rome under a cloud, returning to Palestine where he lived as a monk in Bethlehem for the rest of his life. Over several decades, Jerome wrote biblical commentaries and works promoting monasticism and asceticism. Most importantly, he produced fresh Latin translations of most of the Old and New Testaments, based on the original biblical languages. This work formed the basis of the Vulgate, which remained the standard Scriptural text of the western church for over a millennium. 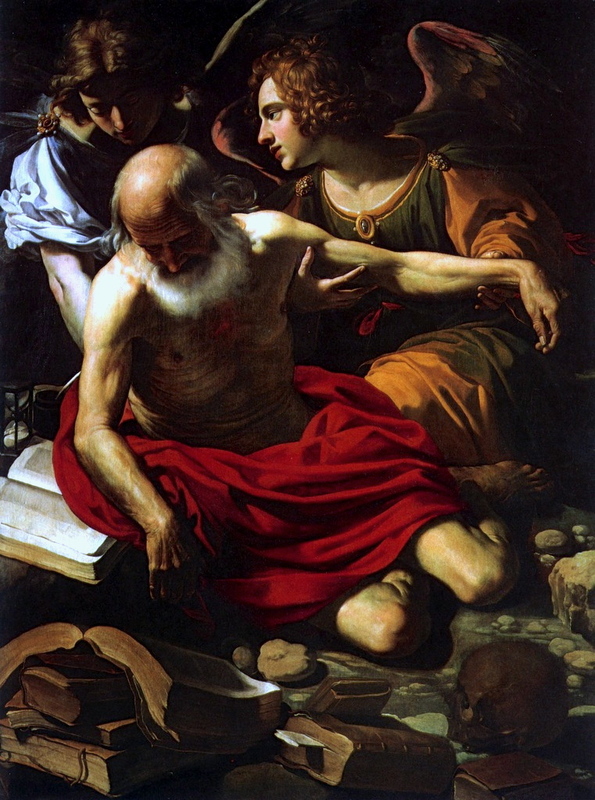 Artwork: Rutilio Manetti, Saint Jerome Supported by Two Angels, 1628. Oil on canvas, Fondazione Monte dei Paschi, Siena. O EVERLASTING God, who hast ordained and constituted the services of Angels and men in a wonderful order: Mercifully grant, that as thy holy Angels alway do thee service in heaven, so by thy appointment they may succour and defend us on earth; through Jesus Christ our Lord. Amen. The archangel Michael first appears in the Book of Daniel, where he is described as “one of the chief princes” and as the special protector of Israel. In the New Testament epistle of Jude (v. 9), Michael, in a dispute with the devil over the body of Moses, says, “The Lord rebuke you“. Michael appears also in Revelation (12:7-9) as the leader of the angels in the great battle in Heaven that ended with Satan and the hosts of evil being thrown down to earth. There are many other references to the archangel Michael in Jewish and Christian traditions. Following these scriptural passages, Christian tradition has given St. Michael four duties: (1) To continue to wage battle against Satan and the other fallen angels; (2) to save the souls of the faithful from the power of Satan especially at the hour of death; (3) to protect the People of God, both the Jews of the Old Covenant and the Christians of the New Covenant; and (4) finally to lead the souls of the departed from this life and present them to our Lord for judgment. For these reasons, Christian iconography depicts St. Michael as a knight-warrior, wearing battle armor, and wielding a sword or spear, while standing triumphantly on a serpent or other representation of Satan. Sometimes he is depicted holding the scales of justice or the Book of Life, both symbols of the last judgment. Very early in church history, St Michael became associated with the care of the sick. The cult of Michael developed first in Eastern Christendom, where healing waters and hot springs at many locations in Greece and Asia Minor were dedicated to him. Michael is supposed to have appeared three times on Monte Gargano, southern Italy, in the 5th century. The local townspeople believed that Michael’s intercession gave them victory in battle over their enemies. These apparitions restored his biblical role as a strong protector of God’s people, and were also the basis for spreading his cult in the West. The Feast of St Michael & All Angels is also known as Michaelmas. The Roman Catholic Church celebrates today as the Feast of Sts. Michael, Gabriel, and Raphael, Archangels. 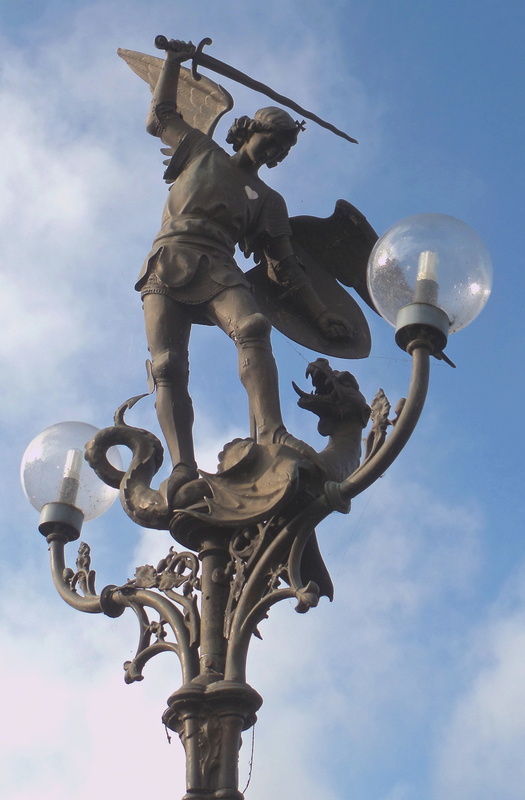 Artwork: Saint Michael, Ghent, Belgium. Photograph taken by admin, 11 October 2014. It is one of those wonderful biblical phrases that can act like a maxim, an ordering principle, for how we proceed with our lives. Here Jesus wants the very best for us and he expects the very best from us. And Paul also shows what this means in his strong exhortation to us to “walk worthy of the vocation wherewith ye are called.” Against the easy complacency and acceptance of mediocrity in our world and day stands this challenging statement; “Friend, go up higher”. Even more there is the whole matter of our awareness and acceptance that we have a God given vocation. We may not like to be challenged. We may not like the implications of such a call. It means recognizing that things are not altogether excellent, right or good with us in our lives. We may prefer instead to expect God to take us as we are, “to bless our mess,” as it were, and to leave us where we are and to make no demands of us. But that is not the Christian religion. Neither true mercy nor genuine charity. It is fundamentally false. It denies the transforming power of God’s grace in human lives. If we are hostile and resentful about this teaching, then we are exactly like those before whom Jesus speaks and acts. There was a healing done on the Sabbath under the watchful eyes of hostility. There was a parable spoken in the face of resentful silence; a parable told to counter our arrogance and our hypocrisy, a parable told to challenge us. Jesus speaks and acts. He teaches. At issue, then and now, is whether we will be teachable. Only so can we ever hope to “walk worthy of the vocation wherewith [we] are called”. 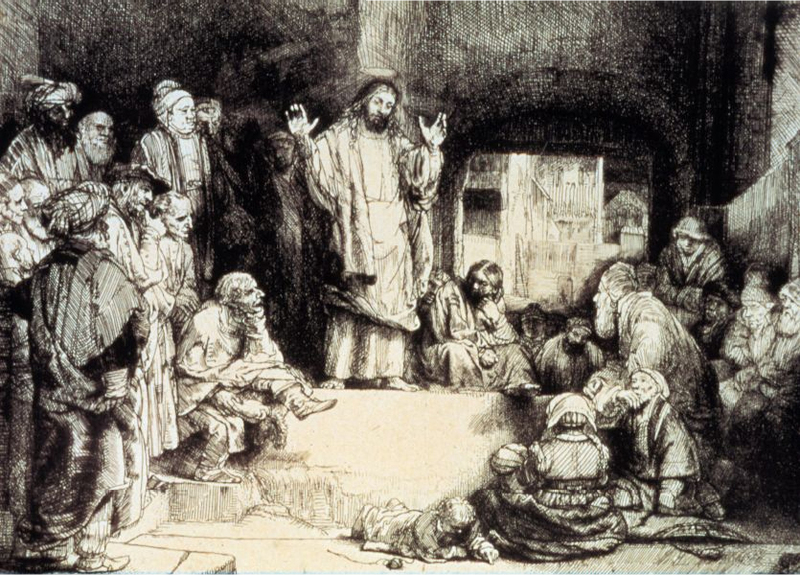 Artwork: Rembrandt, Christ Preaching (La Petite Tombe), c. 1652. Etching, drypoint and burin on paper, Rijksmuseum, Amsterdam. The Haven of them who sail; be thou all to all. Blessed be Thou, O Lord our Father, for ever and ever. Amen. 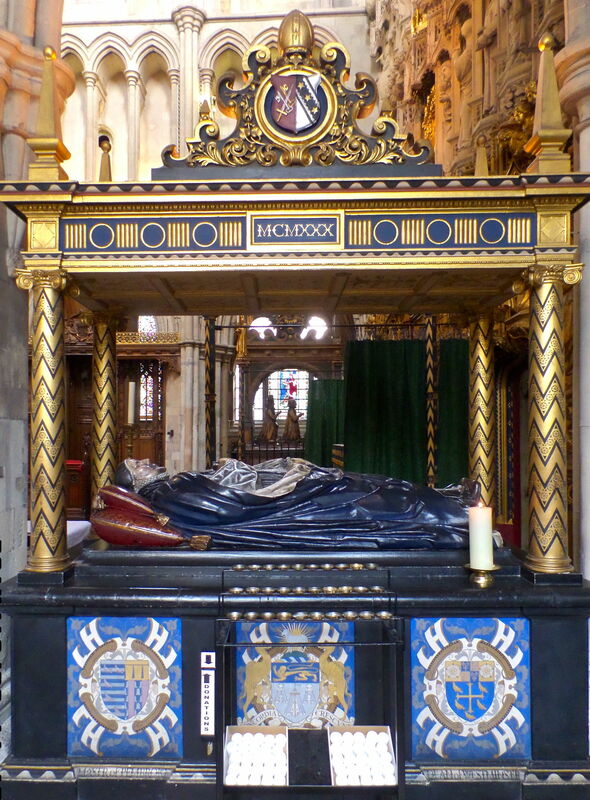 Graphic: Tomb of Bishop Lancelot Andrewes, Southwark Cathedral, London. Photograph taken by admin, 20 October 2014. The call of Matthew from “the receipt of custom” – what a wonderful phrase! – seems rather disturbing and disquieting. Jesus says “follow me” and “he arose and followed him.” It seems so abrupt and arbitrary. It is a story of conversion but without the inner struggle and conflict displayed in the conversion of St. Paul. Somehow the external details suffice. He is a tax-collector and that is associated here with being a sinner. Why? Publicans, as the name suggests, have an immediate connection to the res publica, the public things, the things pertaining to the life of the political community especially in its natural and economic life. There is a certain necessity to taxes, unpleasant as they may seem to be. Why, then, the association with sin? There are two reasons. The first has to do with the particular context. Matthew’s tax-collecting is seen as a kind of spiritual betrayal, a form of treason against the spiritual community to which he properly belongs. He is collaborating with the Roman overlords in collecting taxes for them from his own people while benefiting personally. Rome had outsourced tax collecting! Unlike contemporary politics, “politics within the limits of economics” where the state exists for the markets, here there is no doubt that the economic is subordinate to the political and that the political is inescapably spiritual. It is a question of fundamental loyalties and identities. Matthew, like Zacchaeus, is despised by his own community for being a tax-collector. The second reason is more universal and brings out the real problem with each and every form of economic determinism. It is signaled in the Collect. Matthew’s conversion applies to everyone. “Grant us grace to forsake all covetous desires and inordinate love of riches.” It is a question of disordered love, of love in disarray, a question of fundamental loyalties and identities for each of us. We sense the gospel imperative, “ye cannot serve God and Mammon” – worldly riches – “for what does it profit a man if he gain the whole world and lose his soul?” The suggestion of the gospel is that we are more than our material acquisitions and more than our acquisitiveness. We are spiritual creatures who cannot, ultimately, be satisfied with anything less than the kingdom of God. O ALMIGHTY God, who by thy blessed Son didst call Matthew from the receipt of custom to be an Apostle and Evangelist: Grant us grace to forsake all covetous desires and inordinate love of riches, and to follow the same thy Son Jesus Christ; who liveth and reigneth with thee and the Holy Spirit, one God, world without end. Amen. Artwork: Cornelis de Smet, Saint Matthew, c. 1780. Cathedral of Our Lady, Antwerp. Photograph taken by admin, 13 October 2014. Paul’s words in Ephesians are powerfully and wonderfully illustrated in the Gospel (Luke 7.11-17). The raising of the only son of the widow of Nain reveals the love of Christ “which passeth knowledge,” the love which goes beyond what we can know and do simply on our own. Something is being shown to us that belongs to the deeper truth of our humanity; a truth found in our engagement with God. Without the love of God, the suggestion is, we are utterly incomplete, bereft and empty. What Paul seeks for us is what Christ provides for us, namely our being “rooted and grounded in love” and being able to comprehend – to understand – the wondrous extent of the divine love which goes beyond our human capacities. To be aware of this is to be awakened to an ethic of action rooted in compassion. The last several Sundays of the Trinity season have presented us with this underlying concept: our human actions as rooted and grounded in God’s love. Compassion was the operative word in The Parable of the Good Samaritan. That compassion is ultimately the love of Christ, the Son of God who became man for us and who engages us in our brokenness and hurt to heal and restore and to set us in motion towards one another. That compassion of Christ is the motivating force in the story of the one leper who “turned back, giving him thanks and he was a Samaritan,” too. Thanksgiving is ultimately rooted in the divine love which perfects our human loves. Thanksgiving is a form of love at work in us. This morning we have the powerful story of the raising of the only son of the widow of Nain. It is one of three stories where Jesus meets us as mourners and each time something happens that is transformative. “Be ye transformed in the renewing of your minds,” as Paul says elsewhere. And, indeed, what we see and hear transforms our thinking and our doing. The operative word here in the Gospel is once again, the word, compassion. “When the Lord saw her, he had compassion on her.” Compassion is deep love, the deep love of God in Jesus Christ which reaches out to our humanity, at once to the sorrow and loss of the widow and to the death of her only son. We are meant to feel her pain, to use a much abused expression. To put it better, we are meant to empathise with her loss and to feel its depth. She is utterly bereft – a widow who has lost her husband and now a mother who has lost her only son. We sense and feel her desolation, the utter emptiness of her being.